Overall, I absolutely loved this scrapbook kit and used it to make a beautiful first birthday present for my niece. However, my only complaint is that one of the embellishments has a significant spelling error, which I only noticed after already having attached it to a page... as a neurotic perfectionist this definitely disappointed me a lot. I am not sure if this was the case for all kits or I just happened to be unlucky, but I hope FaCraft looks into it! Love this! But one of the pages has a swear word! Not offended at all but making a scrapbook for my grandparents could do without "write your own damn story" hahaha. So just in case that's an issue for yo, now you know! I covered mine up. Overall though it's a great kit! Very cute appliqués, stickers, and cutouts. The only thing that would have made it better is if the pages were double sided so you could fill the whole album. Now I have to get more paper, but still very cute! 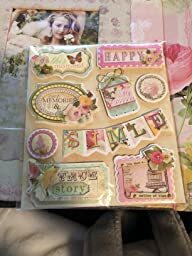 This scrapbook kit is super cute. I love all of the little embellishments it comes with. My only issue is with the spelling in the word “smile” on one of the stickers. 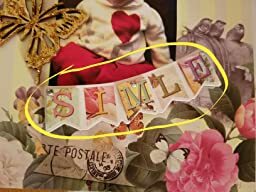 It’s spelt “simle”. Manufacturing issue, not amazon issue. I saw another review mention this same thing and thought for sure it was just a misprint on only one but now I’m thinking it may be a bigger issue. Manufacturer, please correct this. I myself have no problem cutting the letters apart and rearranging them so it’s not a deal breaker but it definitely needs to be addressed.also, the wooden embellishments are cheap feeling. Part of the butterfly broke off as I was trying to get it off of the paper. They don’t have stickers on them so you do have to use the double sided stickers they give you to adhere them to your pages. I give this a 4 because it’s a cute kit and serves its purpose but needs a little better manufacturing.